Mom: Do you have your sword and breastplate? 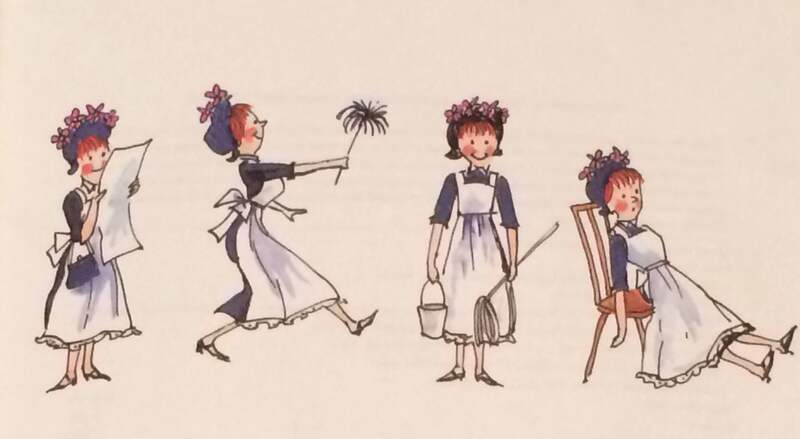 Photo by Aimee Paulson Fritz from the book Amelia Bedelia by Peggy Parish (pp 26-27). Illustrations by Fritz Siebel Revised Illustrations (c) 1992 by the Estate of Fritz Siebel. I knew I couldn’t do “all things.” I couldn’t speak French or jump rope. I didn’t have x-ray vision or know how to make the flying carpet I ached for. There were dozens of things I wanted to do every day that I couldn’t. Poor Mom, she didn’t know what she was talking about. For years when she asked me if I had “my breastplate,” I thought she was asking if I was wearing a bra. Which was crazy, because I was 70 lbs and nine years old. If I were wearing a bra, wouldn’t she know? I just let the sword thing go. As an enthusiastic new believer in Jesus, Mom dove in the deep end and always surfaced with more crazy statements. My favorite was, “Aimee, the Bible is The Truth. Anything you’ll ever want to know is in here.” Um, no, Mom. I wanted to figure out how people got color blind, and who invented popsicles. I skimmed some pages and there was nothing like that in the Bible. Love never fails – what about divorce? God is jealous – isn’t jealousy bad? Be salt and light – why and how? Take, eat, this is my body – ew! As a cantankerous and contrary kid, the Bible just wasn’t going to work for me. I shared before that the Psalms saved my soul. It was poetry that drew me in. I fell in love with God through metaphors, imagery, hyperbole, and personification. Plain words would never be enough to capture the full nature and character of the God who exists outside of time, creates all things, and knows all things. There’s something endearing, though, about a new Christian taking everything literally, as a humble, eager learner of the bible. Like dear Amelia Bedelia, trusting, soft-hearted, and teachable. She hears, “I can do all things through Christ who gives me strength” and she’s inspired. I can pass this test! I can finish this race! I can shut my mouth! My youngest daughter is in this season. My other two kids have reasons to be suspicious about God. The Bible promises they’ve always heard don’t feel true. The literal words of the Bible and their bad experiences don’t match up. They feel sorry for me and my silly faith. Instead of being afraid or angry about this, I’m thankful. This means they’re growing up. They need more than the tiny barnyard of literalism. So I’m out in the fields, extending the fences and expanding the boundaries to make room for their angry questions, eye rolls, and wounds. I try to pick my battles, empathize, and wait. Someday they’ll pick up the Bible for themselves, and deep will call to deep. The words will come to life, mingle with their holy imaginations, and link with their understanding. Maybe they’ll figure out what that “breastplate” is about. Hopefully they’ll explain it to me. Some take on the challenge of understanding the Bible with enthusiasm. We use concordances, do Bible studies and listen to different teachings. We learn about context, metaphors, original languages, and traditions. We find teachers we like and let our understanding of “biblical truth” be shaped in life-changing ways. Do you know how you came to understand the Bible? Take a few minutes to write down the names of your teachers. Hopefully you can thank God for them. But you might have a few names that turn your stomach. If you’re ready, consider forgiving them for any ways you were deceived, intentionally or unintentionally. Dictionary – Are you sure you know what that word really means? Thesaurus – Would other versions of that word help you understand? Biblegateway.com – Type in any Scripture reference and see all the different translations of it. This is my current favorite way to bring new taste to stale verses. Concordance – These books are lists of where to find specific words throughout the entire Bible. Like every time “porridge” or “armor” or “peace” is mentioned. Look for one in a used bookstore. Commentary – This is straight up interpretation. A Bible scholar gives a commentary on what’s happening in the text (like sportscaster describing the game, or a director explaining a film). If you have a pastor or Bible study leader you enjoy learning from, ask what commentaries they use. Words of Delight by Dr. Leland Ryken – This book made me fall in love with the Bible’s artistry, economy, and power. 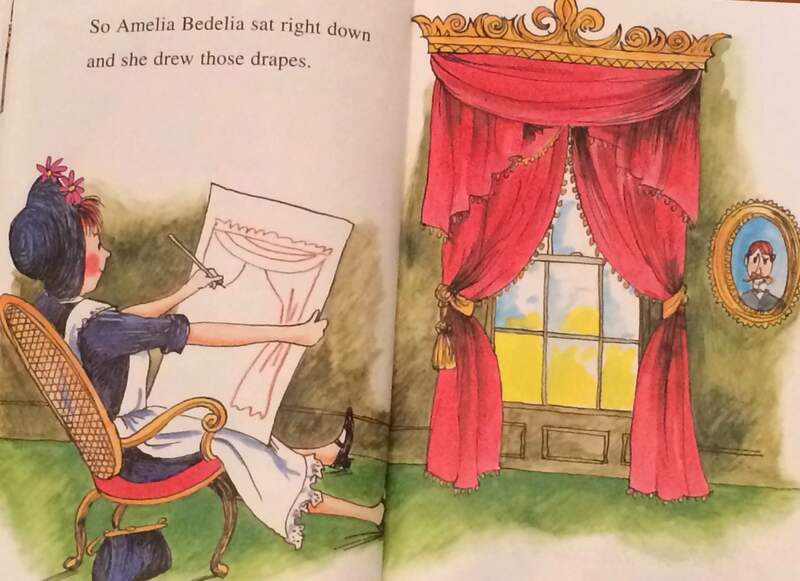 “So Amelia Bedelia sat right down and she drew those drapes.” Photo by Aimee Paulson Fritz from the book Amelia Bedelia by Peggy Parish (pp 26-27). Illustrations by Fritz Siebel Revised Illustrations (c) 1992 by the Estate of Fritz Siebel. Your thoughts are beautiful, as always! Thanks, Lindsay! She did stress us out! I think that shows the power of literalism, and how words can be scary!